Trying to make comparisons between mattresses can be extremely difficult. With so many options out there, there comes a point where it seems like you’re just looking at the same white rectangle again and again. 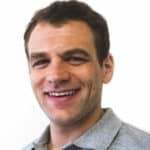 This mattress comparison is designed to remove the marketing speak and other sales tactics you’d find in a typical mattress store. We’ll be breaking down the Casper vs. Nature’s Sleep mattresses looking at how they are constructed, materials, feel, comfort, cooling, and more. By the end you should have the information you need to make the most informed and best decision for you. Looking for the quick version? Jump to the end and check out the review summary for the short version. The Casper mattress is a hybrid mattress built from 4 different foam layers. Hybrid mattresses use different types of foam to maximum certain benefits, while minimizing other negative attributes. 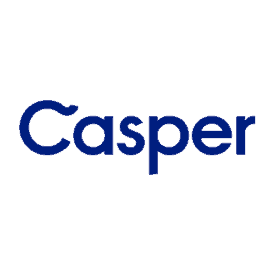 The cover of the Casper mattress is a poly blended fabric. The white piece is a knit fabric that’s created in South Carolina. It is 100% polyester. The grey side panel pieces are a 50/50 blend of polyster and polypropylene. The side panel fabric is imported from Belgium. The cover has a nice softness to it and has a good stretch. The grey pieces are fairly sturdy and serve as a good perimeter for the mattress. The white piece has a degree of porousness to it, which is great for cooling and breathability. The Casper’s firmness is a 6-7 out of 10 on the firmness scale (where 10 is the most firm). I’m about 150 pounds. From my perspective the Casper feels at a 6 out of 10. However, many of my readers have contacted me to say that they thought the Casper was more on the firmer side. Based on this feedback I believe the Casper has a tendency to feel slightly firmer for heavier sleepers. If you’re 180+ pounds you’ll likely feel the Casper is closer to a 7 out of 10 on the firmness scale. This is because you’ll sink deeper into the mattress, engaging the memory foam and support foam layers more. In terms of foam mattresses Casper originally made a name for themselves as one of the more bouncy foams. Prior to Casper when people heard the word foam they would associate it with being very firm and often resulting in that “quick sand” / stuck feeling. The Casper does a good job of shaking this stereotype off. The latex layer on top of memory foam results in a nice balanced bounce feeling, 1-1.5″ of sinkage (in a normal lying down position), good hug / body contour, and good cooling. Support is consistent and stable in all sleeping positions. Returns – very easy, if you aren’t happy just contact customer support and they’ll make it right. You can get 100% money back if you decide it isn’t right for you within 100 days. 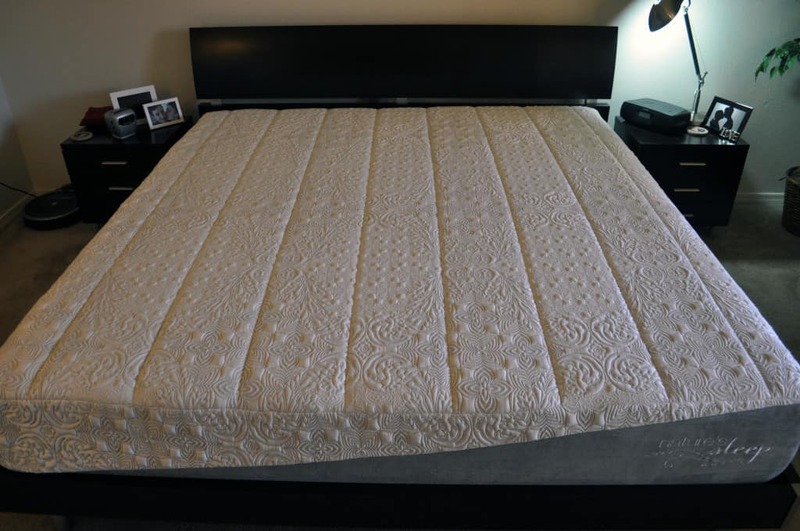 For this review we’ll be looking at the Nature’s Sleep Emerald gel memory foam mattress. Nature’s Sleep has many models within their full line. The Emerald gel is their newest model using some of their most advanced foams. 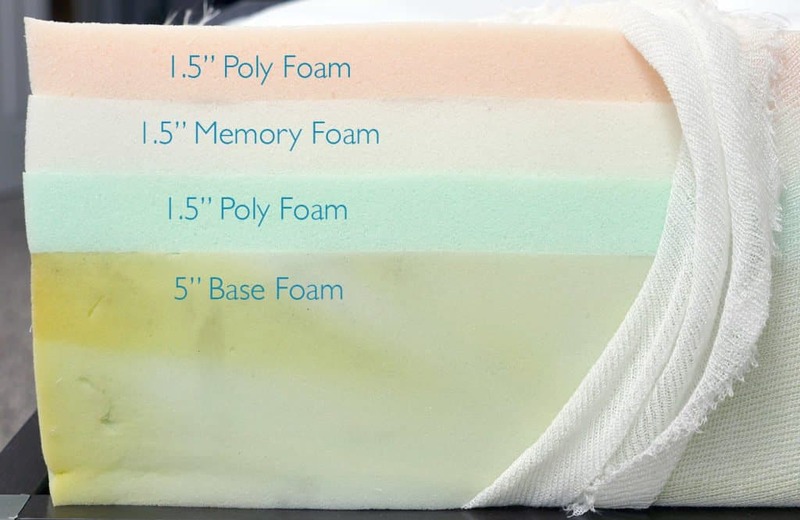 The Nature’s sleep mattress is built from 4 different layers of advanced foam. It’s a slightly thicker mattress at 12″ thick. Top layer – this is a 1.0″ layer of visco memory foam. This layer provides great softness and comfort. It’s also highly reactive, so it will move and change with you as you move around during the night. Second layer – this is a 2.0″ layer of gel memory foam. Gel infused memory foam helps to absorb heat from the surface level of the mattress. This heat is expelled out of the sides and bottom of the mattress, resulting in a constant flow of cool air into the mattress. Third layer – this is a 1.0″ layer of Vitex memory foam. It helps to work with the gel memory foam layer to provide deep compression support and pressure relief. Like all of the memory foams within the mattress it’s also highly breathable and responds quickly to changes in position. This layer also acts to create what Nature’s Sleep calls the “elevator effect”. It helps stomach sleepers by providing more / less support based on weight and pressure. This helps maintain proper spinal alignment and reduces pressure on your internal organs and your breathing. Bottom layer – this is an 8.0″ layer of high-density support foam. This layer provides deep compression support, breathabilty, and acts as the foundation for the top comfort layers. One look and feel of the cover and it’s easy to tell it’s a quality piece of fabric. The top white portion of the cover is a poly / spandex / visco blend. 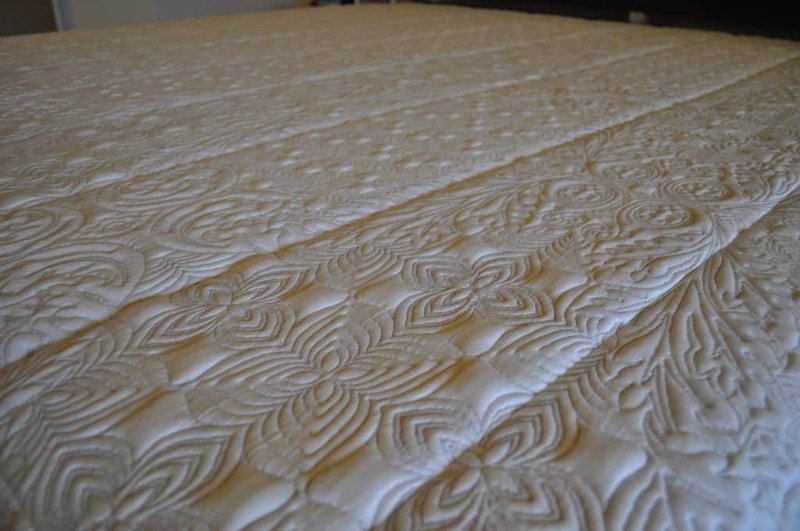 It’s quite thick (thicker than Casper), has a traditional floral style, and it does a good job at helping to increase the cooling of the mattress. The grey side panels that run along the perimeter of the mattress are a micro-suede. The cover is removable, but not machine washable. Also, the cover is anti-microbial and allergen resistant. The Nature’s Sleep mattress has a fairly unique feel. It’s a 6 out of 10 on the firmness scale (where 10 is the most firm). The mattress has been specifically designed to be ideal for stomach sleepers. The foam layers work together to create an “elevator effect”. 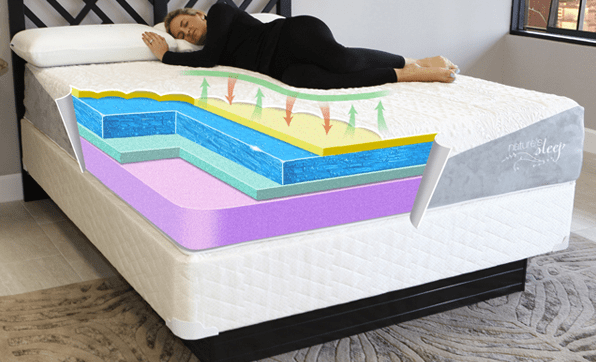 This effectively means that the mattress adds or reduces support based on weight, pressure, and position to help provide stomach sleepers with an improved sleeping position. This position helps keep your spine straight, reduce strain on breathing, and reduce pressure on internal organs. While the mattress is designed with stomach sleepers in mind, it’s still a very good option for non-stomach sleepers as well. My wife sleeps on her back and side and found the Nature’s Sleep to be a comfortable option. This mattress has a bit of a cross over type feel. It’s not exactly like traditional memory foam, but it’s also not like a hybrid, latex, or polyfoam mattress. There’s a fairly high degree of hug. In a normal lying position you’ll see 1.5-2″ of sinkage. Despite the depth of the hug, I never really felt stuck in the mattress. The memory foams within the Nature’s Sleep are more advanced than traditional memory foam. This allows you to move around and have the mattress more quickly adjust to your new position. As a stomach sleeper I was fairly impressed with the comfort and support it was able to achieve. This is the first mattress I’ve slept on that was designed specifically for stomach sleepers. It really does create a nice feel. I was well supported without creating pressure points on my stomach, back, and side. Below is our complete side-by-side comparison of the Casper vs. Nature’s Sleep mattress (Emerald Gel model). Should you buy a Casper or Nature’s Sleep mattress? I like both of these mattresses a good bit. I think they are both great mattresses in their own right. While there are similarities between the Casper and Nature’s Sleep they are also quite different…so much so that I think it’s really hard to make a fair comparison between them. I think the Casper or Nature’s Sleep could be the right mattress for you depending on your specific needs, desires, and other sleep preferences. You want more bounce – with a top layer of latex Casper has a bit more bounce than the Nature’s Sleep. 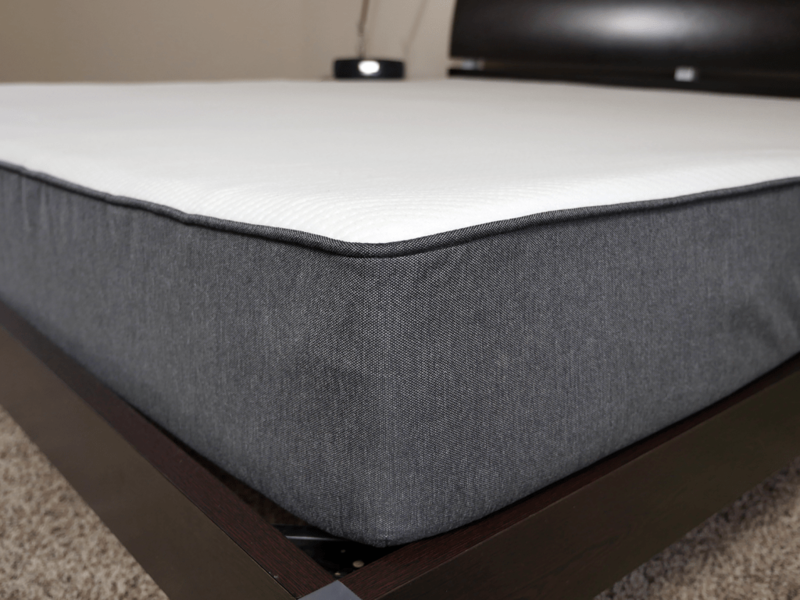 You want a non-memory foam feel – despite the fact it has a middle layer of memory foam in it the Casper doesn’t feel anything like traditional memory foam. There’s no deep sinkage, there’s no feeling stuck, and there’s no feeling like “quick sand”. It’s quite responsive and changes quickly to your movements. You want a leaner aesthetic – the Casper’s 10″ profile gives it a sleeker modern aesthetic look compared to the 12″ profile of the Nature’s Sleep. You’re a stomach sleeper – the Nature’s Sleep Emerald gel mattress has been specifically designed for stomach sleepers. It does a wonderful job of helping support stomach sleepers to ensure proper spinal alignment and easing pressure on breathing / internal organs. It’s also a good mattress for side / back sleepers, but where it really crushes it is for stomach sleepers. You’re want better deep compression support – the Nature’s Sleep is 12″. The 2″ of extra thickness results in better deep compression support (which is a big factor, especially for heavier sleepers). Additionally, the extra thickness will result in improved longevity and durability of the mattress. You’re looking for a memory foam feel, but one with more responsiveness – the Nature’s Sleep definitely has a bit of the classic memory foam feel. There’s a high degree of hug and body contouring. While it does feel a bit like classic memory foam it is also quite responsive. This means it will change its shape more quickly to adjust to your movements. You want to buy from a more established company – Nature’s Sleep has been in the business a long time. They’ve been creating great sleep products for 15 years and have a very well established reputation.